The Office 365 Outlook connector enables interaction with Outlook in Office 365. Use this connector to create, edit, and update contacts and calendar items, and also get, send, and reply to email. Build your workflow using the email and calendar features within Office 365. Use triggers to start your workflow when there is a new email, when a calendar item is updated, and more. Use actions to send an email, create a new calendar event, and more. For example, when there is a new object in Salesforce (a trigger), send an email to your Office 365 Outlook (an action). This article shows you how to use the Office 365 Outlook connector in a logic app, and also lists the triggers and actions. This version of the article applies to Logic Apps general availability (GA). To learn more about Logic Apps, see What are logic apps and create a logic app. Before your logic app can access any service, you first create a connection to the service. A connection provides connectivity between a logic app and another service. 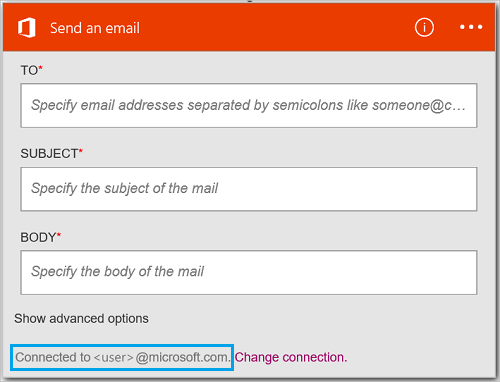 For example, to connect to Office 365 Outlook, you first need an Office 365 connection. To create a connection, enter the credentials you normally use to access the service you wish to connect to. 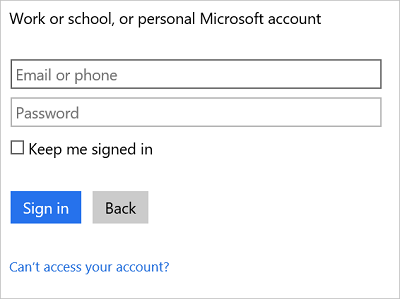 So with Office 365 Outlook, enter the credentials to your Office 365 account to create the connection. Before using your Office 365 account in a logic app, authorize the logic app to connect to your Office 365 account. You can do this easily within your logic app on the Azure portal. These credentials are used to authorize your logic app to connect to, and access your Office 365 account. A trigger is an event that can be used to start the workflow defined in a logic app. Triggers "poll" the service at an interval and frequency that you want. Learn more about triggers. 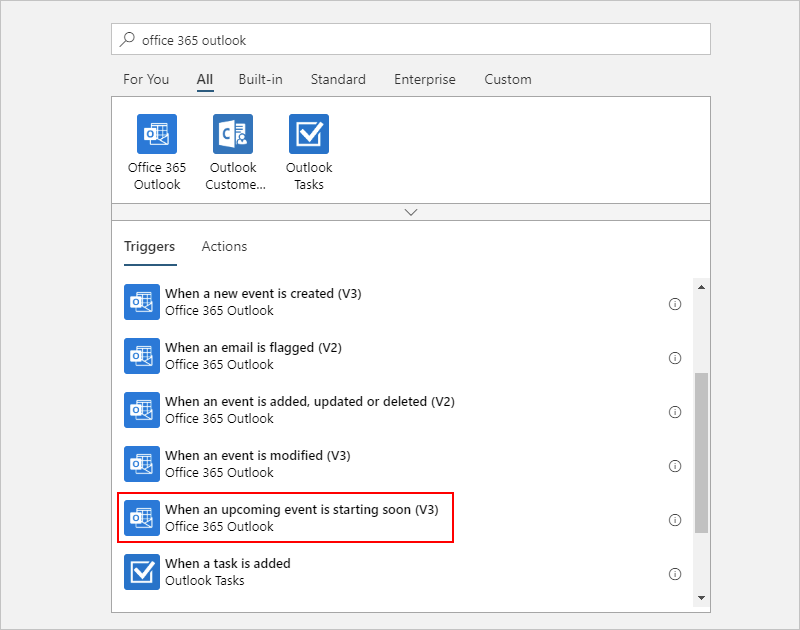 Select Office 365 Outlook - When an upcoming event is starting soon. If a connection already exists, then select a calendar from the drop-down list. If you are prompted to sign in, then enter the sign in details to create the connection. Create the connection in this topic lists the steps. In this example, the logic app runs when a calendar event is updated. To see the results of this trigger, add another action that sends you a text message. For example, add the Twilio Send message action that texts you when the calendar event is starting in 15 minutes. Select the Edit button and set the Frequency and Interval values. For example, if you want the trigger to poll every 15 minutes, then set the Frequency to Minute, and set the Interval to 15. Save your changes (top left corner of the toolbar). Your logic app is saved and may be automatically enabled. An action is an operation carried out by the workflow defined in a logic app. Learn more about actions. Select the plus sign. You see several choices: Add an action, Add a condition, or one of the More options. 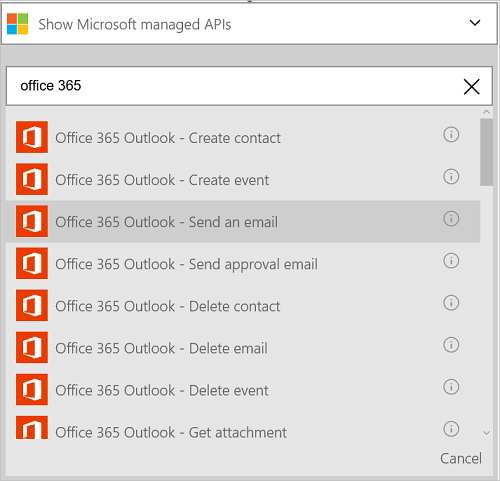 In the text box, type “office 365” to get a list of all the available actions. If you are prompted for the connection information, then enter the details to create the connection. Create the connection in this topic describes these properties. 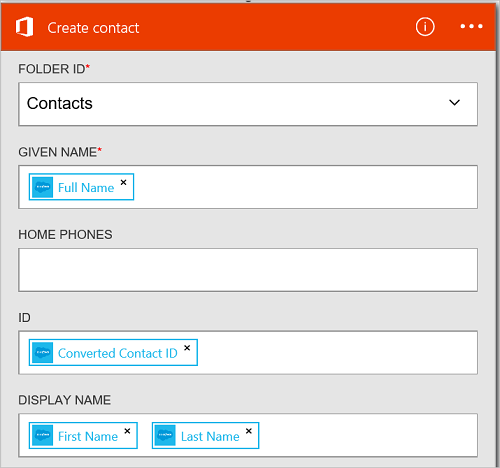 In this example, we create a new contact in Office 365 Outlook. You can use output from another trigger to create the contact. For example, add the SalesForce When an object is created trigger. 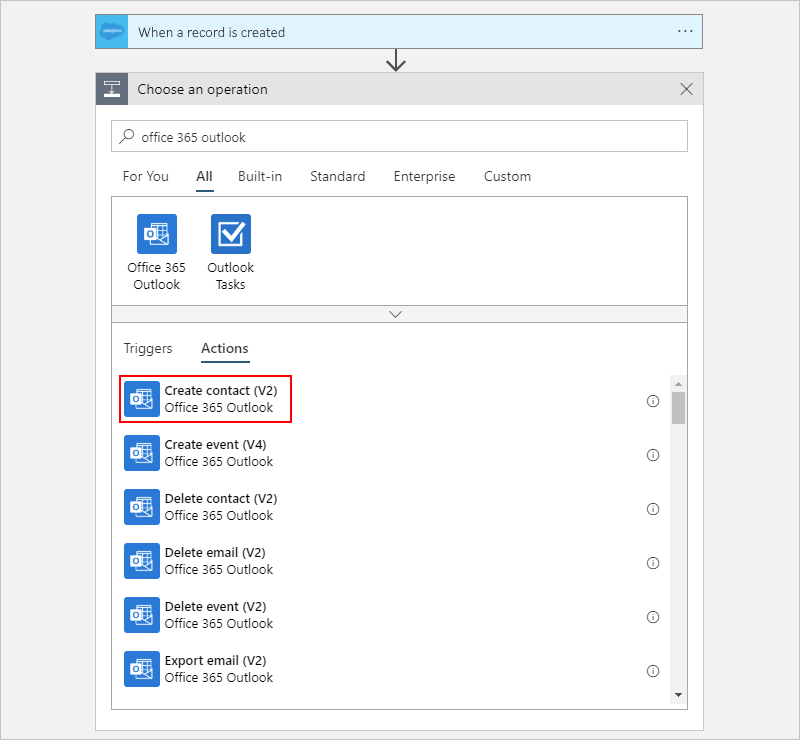 Then add the Office 365 Outlook Create contact action that uses the SalesForce fields to create the new contact in Office 365. View any triggers and actions defined in the swagger, and also see any limits in the connector details. Create a logic app. Explore the other available connectors in Logic Apps at our APIs list.